We are a linedance club with over 100 members and we all have fun with dancing to the latest country music. 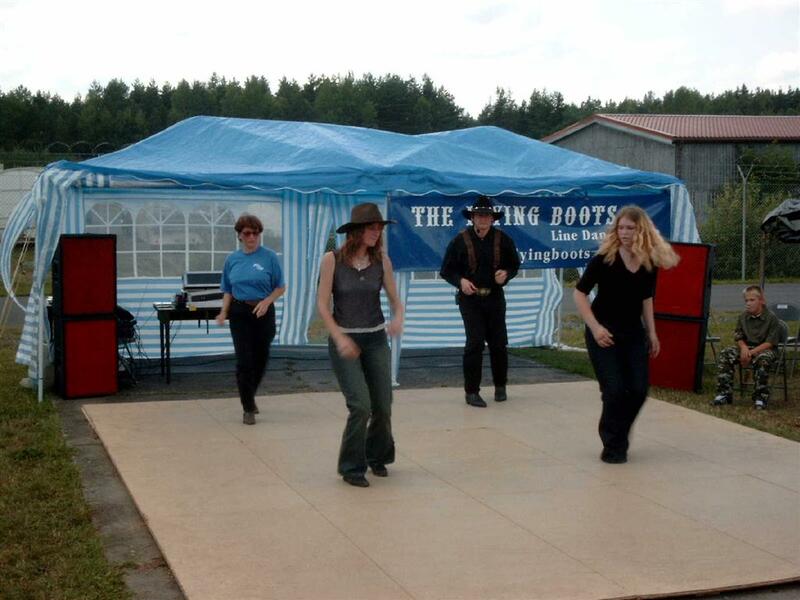 The Flying Boots founded in October 1999 with about 25 people. We had our first steps in Weiden at a place called "SUSAN". Unfortunatelly that bar had to close to make room for other bars like "B22" or "NiteZone"
During the past years we found our home over Kemnath and Kastl finally in Eschenbach. We meet there every friday at the "SCHERM KARL" where you can always have some fun. There are dance lessons for all and a few times a year we start a brandnew dance class for beginners. Furthermore we have a place at the German-American Volksfest in Grafenwöhr for a bunch of years. You surely saw our big dancing stage, our eventmobil or our beertent there. Our dancefloor is always a good spot to meet friends and other linedances clubs. We dance 12 hours a day on the Volksfest. Then we have some other events during the year like the legendary "Walk&Grill", we do daytrips and other parties. Interested? Do not hesitate and come to Eschenbach - it costs no money, just a bit time and fun.